This salad takes very little time and is great for light dinner, picnic, or brunch. Even picky kids love it. It tastes best when refrigerated and is a nice change if you usually have heavier dishes. Packed with tasty and colorful ingredients, this is a healthy alternative to pre-bagged salads. You can experiment and add on-hand ingredients too! This versatile salad is a good pick if you don't have time for a lot of shopping. The best part is that it goes perfectly well with many dishes, and you can also serve it as a side dish. Rinse and drain the beans and chickpeas before preparation. Use a large salad bowl to combine the ingredients. Add the chickpeas, white kidney beans, and red kidney beans. Chop onion and add to the bowl. To prepare the vinaigrette dressing, use a separate bowl and mix vinegar and olive oil. Whisk well. You can add salt and pepper to taste. Pour the olive and vinegar dressing over the beans mix and toss. Refrigerate for 2 - 3 hours, toss, and serve. 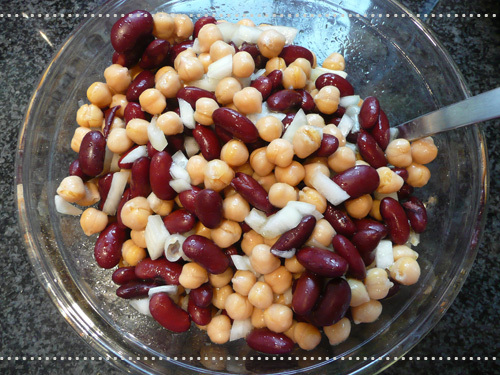 You can also add other bean varieties to make this flavorful salad.